I appreciate Quakerism’s absence of rituals—an appreciation born from many years in the Lutheran Church, kneeling on command, singing hymns someone else chose, reciting a creed I didn’t understand, and daydreaming through mumbled invitations to communion. We unprogrammed Quakers, with our hour of silent worship broken occasionally, and briefly, by someone moved to speak, limit our rituals to handshakes at the end of meeting and announcements about upcoming committee meetings or protests or potlucks to raise funds for one good cause or another. My Quaker Meeting (still a Preparative Meeting as we discern whether we’re ready to be a full Monthly Meeting) has a history of not accepting even the few standard forms that most Quaker meetings adhere to today. For example, rather than a Nominating Committee, we formed a Gifts and Talents Committee to identify which members are best suited (have gifts and talents) for the various roles that keep the Meeting going. Instead of a Worship and Ministry Committee, we have a small group of people who attend to our Meeting’s Spiritual Life. And for those who encounter the Divine in music, we’ve designated our worship hour on the last Sunday of the month as Singing Sunday. So, it’s no surprise that at the end of October we had a “Meeting for Worship for Apple Pressing.” No one remembers for sure if this was the third or fourth or fifth such event, but we know how it began. One fall, one of our members, an arborist, reported he’d noticed apple trees around the island that weren’t being harvested. 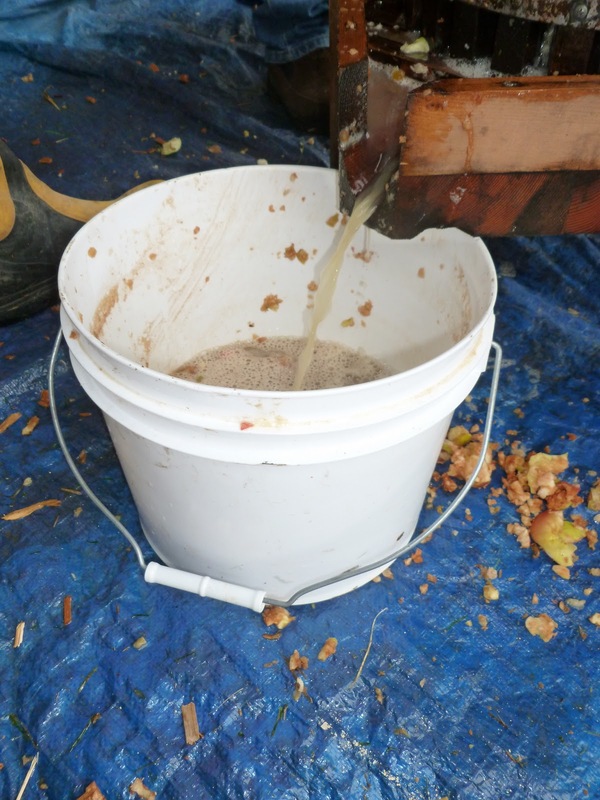 He offered to contact the owners (many of whom he knew because he’d pruned their trees) and to lend his wooden cider press if we wanted to glean apples and make juice to share. This year, eighteen of us worshipped together in this way again, putting the Quaker testimony of community into action—and possibly furthering the causes of peace, simplicity, and equality as well. At the close of worship the week before the pressing, half a dozen of us had gathered in the orchard next to the home where we meet. Sun warmed the cool fall afternoon, and the scent of sweet, ripe apples wafted through the trees’ brittle, twisted branches. Although our arborist couldn’t identify the varieties we were harvesting, he was able to chase away the resident bull who pawed and snorted his displeasure that we’d invaded his cow-pile-littered turf. The last Sunday of October, we worshipped in silence for 15 minutes, and then adjourned to the barn. 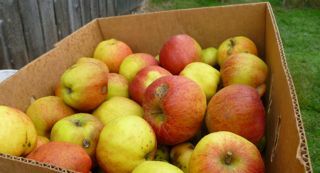 Boxes bulged with the mystery apples from the neighbor’s orchard as well as Galas, Akanes, and Liberties from members’ trees. Under drizzly skies, we set up an assembly line of washing, disinfecting, cutting, pressing, and pouring. Just like at quilting bees of earlier times, stories flowed while hands worked. Memories of younger days, updates about children and grandchildren, words of support to a woman with an ailing husband, and reports of recent and future travels circulated among us, adding to the story of our little group of seekers. Fresh scones, apple bread, hot tea, and coffee sustained us, followed by sips of the spicy, caramel-colored nectar that poured from the apples under the weight of the press. Two hours later, our efforts had yielded over twenty gallons of juice divided up among all those who helped, with some left for the couple who had let us glean from their trees as well as for the residents of our community’s assisted living home. 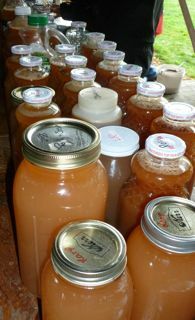 Meeting for Worship for Apple Pressing – it just might turn into a Quaker ritual.